For maps, where to stay, photos, and tourist information, use the Cuiaba online travel route planner . In March, daily temperatures in Cuiaba can reach 37°C, while at night they dip to 26°C. You will have some time to spend on the 5th (Thu) before leaving for Pedro Juan Caballero. Home to a famous shopping center, Pedro Juan Cabellero welcomes visitors looking for deals on clothing, electronics, furniture, and many other consumer goods. Start off your visit on the 6th (Fri): browse the range of quality goods at Shopping China Importados, then buy something for everyone on your list at Shopping Planet Outlet, and then browse the different shops at Studio Center Importados. Get ready for a full day of sightseeing on the 7th (Sat): explore the wealth of natural beauty at Parque Nacional Cerro Cora. For reviews and other tourist information, you can read our Pedro Juan Caballero sightseeing planning tool . You can drive from Cuiaba to Pedro Juan Caballero in 13.5 hours. Alternatively, you can fly. When traveling from Cuiaba in March, plan for slightly colder days in Pedro Juan Caballero, with highs around 34°C, while nights are about the same with lows around 25°C. Finish up your sightseeing early on the 7th (Sat) so you can travel to Resistencia. Resistencia is the capital and largest city of the province of Chaco in north-eastern Argentina. Kick off your visit on the 8th (Sun): tee off at Chaco Golf Club and then take a peaceful walk through Reserva Natural Los Chaguares. To find more things to do, traveler tips, reviews, and more tourist information, go to the Resistencia trip planner . Traveling by car from Pedro Juan Caballero to Resistencia takes 11 hours. Alternatively, you can fly. The time zone changes from Paraguay Time (PYT) to Argentine Time (ART), which is usually a 1 hour difference. Traveling from Pedro Juan Caballero in March, Resistencia is slightly colder at night with lows of 21°C. Wrap up your sightseeing on the 8th (Sun) to allow time to travel to Salta. On the 9th (Mon), take your sightseeing to a higher altitude at Cerro San Bernardo, then take a pleasant ride with a tour on horseback, and then examine the collection at Salta Cabildo. Here are some ideas for day two: contemplate the waterfront views at Quebrada de San Lorenzo. To see traveler tips, where to stay, photos, and more tourist information, use the Salta trip itinerary planner. Getting from Resistencia to Salta by car takes about 10.5 hours. Other options: fly. Expect a bit cooler temperatures when traveling from Resistencia in March; daily highs in Salta reach 28°C and lows reach 17°C. Wrap up your sightseeing by early afternoon on the 10th (Tue) to allow time for the car ride to San Pedro de Atacama. Take a break from the city and head to Piedras Rojas and Laguna Chaxa. You'll explore the less-touristy side of things at Nature & Wildlife Tours and Valle Arcoiris. It doesn't end there: relax and rejuvenate at Atacama Desert and take in the natural beauty of Geyser del Tatio. To see ratings, maps, traveler tips, and more tourist information, you can read our San Pedro de Atacama trip builder app . You can drive from Salta to San Pedro de Atacama in 8.5 hours. Alternatively, you can take a bus. You'll gain 1 hour traveling from Salta to San Pedro de Atacama due to the time zone difference. Traveling from Salta in March, plan for a bit cooler nights in San Pedro de Atacama, with lows around 7°C. Wrap up your sightseeing on the 13th (Fri) early enough to drive to Antofagasta. A major port city of northern Chile, Antofagasta officially became part of the country in 1904, when the Treaty of Peace and Friendship between Chile and Bolivia formerly enshrined a new regional status quo after the War of the Pacific (1879-83). Start off your visit on the 14th (Sat): make a trip to Muelle Salitrero Compania Melbourne Clark, explore the striking landscape at La Portada, and then kick back and relax at Balneario Juan Lopez. For ratings, where to stay, and other tourist information, go to the Antofagasta planner . Traveling by car from San Pedro de Atacama to Antofagasta takes 4 hours. Alternatively, you can take a bus; or take a bus. Traveling from San Pedro de Atacama in March, you can expect nighttime temperatures to be somewhat warmer in Antofagasta, with lows of 19°C. 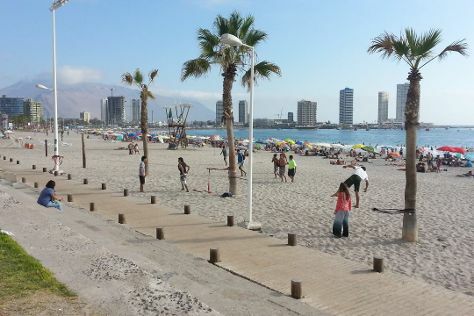 Finish up your sightseeing early on the 15th (Sun) so you can travel to Iquique. On the 15th (Sun), tour the pleasant surroundings at Playa Chanavayita, push the limits with an extreme tour, and then enjoy the sand and surf at Playa Cavancha. To see maps, where to stay, other places to visit, and more tourist information, read Iquique road trip planning tool . You can do a combination of flight and shuttle from Antofagasta to Iquique in 4.5 hours. Other options are to drive; or take a bus. Cap off your sightseeing on the 16th (Mon) early enough to go by car to Puno. On the 16th (Mon), contemplate the long history of La Casa del Corregidor, then head off the coast to Uros Floating Islands, and then contemplate the waterfront views at Lake Titicaca. Get ready for a full day of sightseeing on the next day: head off the coast to Taquile Island. To find photos, more things to do, other places to visit, and other tourist information, you can read our Puno trip itinerary builder app . Traveling by car from Iquique to Puno takes 11 hours. Alternatively, you can do a combination of shuttle, flight, and bus; or do a combination of bus and flight. Due to the time zone difference, you'll gain 1 hour traveling from Iquique to Puno. In March in Puno, expect temperatures between 21°C during the day and 3°C at night. Finish your sightseeing early on the 17th (Tue) so you can travel to Cusco. Start off your visit on the 18th (Wed): hunt for treasures at Mercado Central de San Pedro, then admire the striking features of The Company of Jesus Church, and then soothe aching muscles at some of the top local wellness centers. To find where to stay, maps, ratings, and other tourist information, refer to the Cusco trip planner . Traveling by combination of bus and flight from Puno to Cusco takes 3 hours. Alternatively, you can drive; or take a bus. Traveling from Puno in March, you can expect nighttime temperatures to be a bit warmer in Cusco, with lows of 9°C. Finish your sightseeing early on the 19th (Thu) so you can travel to Machu Picchu. 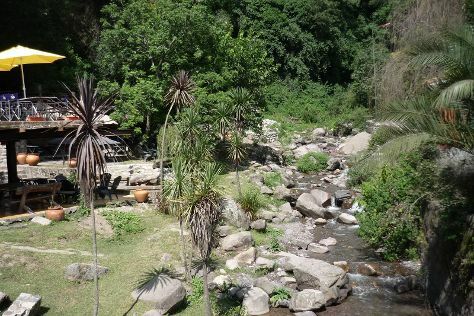 On the 19th (Thu), take in the natural beauty of Hot Springs (Aguas Calientes), then take in the architecture and atmosphere at Iglesia Virgen Del Carmen, and then take in the views from Inca Bridge. Quickly create a custom-made itinerary for Machu Picchu using our trip planner. Traveling by combination of bus and train from Cusco to Machu Picchu takes 3 hours. Alternatively, you can drive; or take a bus. Cap off your sightseeing on the 19th (Thu) early enough to travel to Puerto Maldonado. Kick off your visit on the 20th (Fri): identify plant and animal life at Panthera Sanctuary, contemplate the waterfront views at Tambopata River, and then take a stroll through Native Community of Ese"Ejas. For photos, where to stay, and other tourist information, read Puerto Maldonado holiday builder website . Traveling by combination of train and bus from Machu Picchu to Puerto Maldonado takes 10.5 hours. Alternatively, you can take a bus; or drive. March in Puerto Maldonado sees daily highs of 37°C and lows of 26°C at night. Wrap up your sightseeing by early afternoon on the 21st (Sat) to allow time for travel to Rio Branco. Kick off your visit on the 22nd (Sun): make a trip to Novo Mercado Velho, then identify plant and animal life at Parque Ambiental Chico Mendes, and then admire the striking features of Palacio Rio Branco. To see other places to visit, maps, more things to do, and more tourist information, read our Rio Branco day trip planning website . Traveling by car from Puerto Maldonado to Rio Branco takes 8.5 hours. Alternatively, you can fly. March in Rio Branco sees daily highs of 34°C and lows of 26°C at night. Finish your sightseeing early on the 22nd (Sun) so you can travel to Ariquemes. Ariquemes is a municipality located in the Brazilian state of Rondônia. Start off your visit on the 23rd (Mon): see the interesting displays at Rondon Museum and then admire the natural beauty at Parque Botanico. To see ratings, traveler tips, and other tourist information, read Ariquemes online day trip planner . Explore your travel options from Rio Branco to Ariquemes with the Route module. The time zone difference when traveling from Rio Branco to Ariquemes is 1 hour. In March, daily temperatures in Ariquemes can reach 36°C, while at night they dip to 27°C. Wrap up your sightseeing by early afternoon on the 23rd (Mon) to allow time for travel to Vilhena. Vilhena is the easternmost municipality in the Brazilian state of Rondônia. Kick off your visit on the 24th (Tue): browse the different shops at Park Shopping Vilhena, then see the interesting displays at House of Rondon, and then take in the architecture and atmosphere at Igreja De Nossa Senhora Aparecida. To find photos, more things to do, and more tourist information, read Vilhena day trip planner . Traveling by car from Ariquemes to Vilhena takes 7 hours. Alternatively, you can fly. In March, daytime highs in Vilhena are 34°C, while nighttime lows are 24°C. Finish up your sightseeing early on the 24th (Tue) so you can travel to Caceres. Cáceres is a municipality in the Brazilian state of Mato Grosso. Kick off your visit on the 25th (Wed): enjoy the sand and surf at Praia do Daveron, steep yourself in history at Jacobina Farm, and then look for all kinds of wild species at Taima Ecologic Reserve. To find other places to visit, reviews, where to stay, and other tourist information, read our Caceres online day trip planner . Explore your travel options from Vilhena to Caceres with the Route module. Finish up your sightseeing early on the 25th (Wed) so you can travel to Cuiaba. Kick off your visit on the 26th (Thu): tour the pleasant surroundings at Mae Bonifacia Park and then explore the world behind art at Serviço Social do Comércio-SESC-Arsenal. To find where to stay, more things to do, and more tourist information, use the Cuiaba trip builder tool . You can drive from Caceres to Cuiaba in 3 hours. Cap off your sightseeing on the 26th (Thu) early enough to travel back home.